For kids and adults, there's a lot to look forward to during winter in the Glens Falls region, such as skiing and sledding. However, although there are many activities to enjoy outdoors, parents should first make sure their kids are properly prepared for the winter conditions. To help you out, we've put together a list of tips that describe how you can keep your kids safe and sound in winter. The most important way you can ensure your kids stay safe this winter is by dressing them in warm clothes before they head outdoors. Frigid temperatures can be dangerous in winter, leading to medical emergencies such as frostbite and hypothermia. Have your kids wear removable layers that are waterproof and moisture-wicking, snow boots, a hat, and gloves or mittens. There are a few other ways you can keep your kids warm. During extreme weather conditions, don't let your kids outside. Some examples are snowstorms and low temperatures (-16 degrees Fahrenheit). Also, check on your kids to see if their clothes are wet, and have them come inside for a warm drink from time to time. From busy streets to heavy snow, winter introduces a few new outdoor hazards to the Glens Falls region. Teach your kids how to avoid them so you can feel more confident about their safety. 1. Stay away from snowplows and snow blowers. 2. Never play close to roads, fences, or open water. 3. If you must cross a road, make sure it is clear. Ice can make it hard for drivers to stop. 4. Don't climb on snow banks near roads. 5. Avoid throwing snowballs at people or cars. 6. If you want to build a snow fort or tunnel, have an adult supervise you. 7. Don't put metal objects in your mouth; lips and tongues will freeze to them. 8. Don't eat snow off the ground. 9. Watch out for roofs with hanging icicles and snow. 10. Wear sunscreen; the sun is still dangerous in winter if you're exposed to it for a long time. Ready to hit the slopes this winter? The Glens Falls Region's own West Mountain is one of the most popular choices among local skiers and snowboarders. 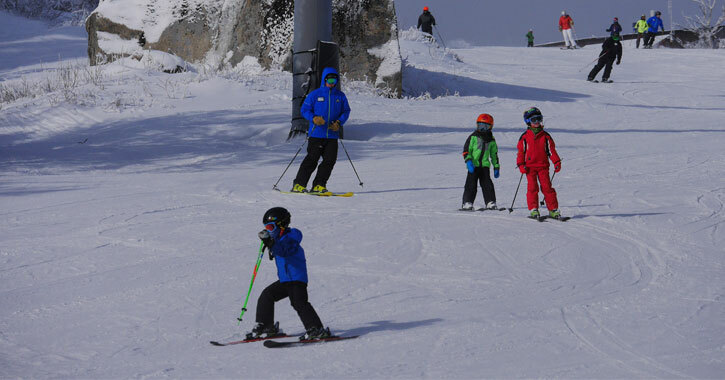 There are easy trails for younger kids to try, and lessons are offered for the inexperienced. For a family road trip, Gore Mountain isn't too far north either. If your kids don't want to take lessons, you can help them learn through experience. Help them dress for the outdoor activity and teach them how to handle themselves on the slopes. A ski/snowboard helmet, wrist guards, and goggles are all essential pieces of gear for children. Although all kids should be supervised while skiing or snowboarding, you should also explain to them how to stay safe themselves. Have inexperienced kids start on a beginner slope so they can practice going slow and fast, and show them where the trail markers are. 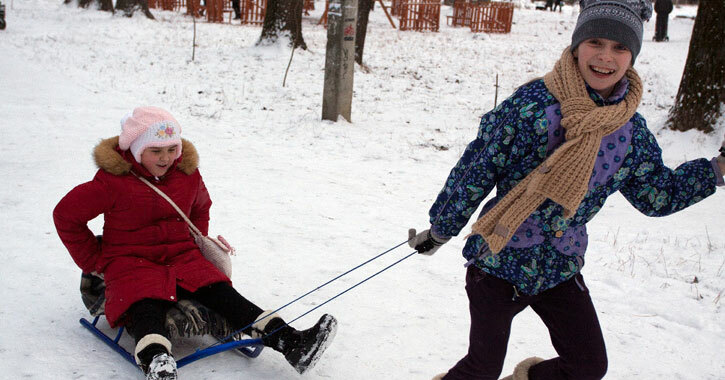 Do your kids enjoy sliding down a snowy hill? Unlike skiing and snowshoeing, sledding and snow tubing don't require a lot of practice to do, which is why many parents choose to bring their children to a local hill in winter. In the Glens Falls Region, there is a fun saucer sledding hill in Crandall Park that is open to the public as long as there is snow. If you don't own your own saucer sled, West Mountain's tubing park is another option in the area. You can plan a snow tubing trip there during the day or evening. While West Mountain has employees who help to keep everyone at the tubing park safe, if you go to a local sledding hill instead, it is up to the parents to watch after their children. As their guardian, it's up to you to determine if a hill is good for sledding, and if so, to have your kids stay safe as they have fun. In most cases, the recommended approach is to have one parent at the top and one at the bottom of a sledding hill. However, a parent should go down the hill with kids under the age of 5. For extra protection, have your kid wear a ski or hockey helmet. For ice skating, the general belief is that indoor ice rinks are safer than outdoor ice rinks. While that is true, it doen't mean you should completely avoid taking your kids to a frozen body of water. If you test an outdoor ice rink and believe it's safe, then your kids will definitely have fun on it. Don't want to worry about checking how safe the ice is in the Glens Falls Region? Try taking your kids to an indoor rink, such as Cool Insuring Arena or the Glens Falls Rec Center. For parents who want to try an outdoor ice rink, the nearest are located at Crandall Park and East Field. Should you decide to check out an outdoor ice skating rink, it's important to know how thick the ice is. The safest ice is blue/clear, and for one person to ice skate on an area, it should be at least 4 inches thick. For a larger group, the ice should be around 8 inches thick. White and gray ice is weaker and not recommended for ice skating; the ice would have to be twice as thick, or it may not be safe at all.